Many options exist for sprucing up a bathroom, whether it is a remodel or new construction. When looking for glass shower doors Dallas TX, here are a few things to keep in mind. For sheer beauty, clear glass is difficult to compete with for luxurious appeal. Clear glass can open up a space by eliminating the visual “wall” created by a shower door. However, while easier to clean, clear glass also shows smudges and spots more readily. Keeping a squeegee in the shower to quickly wipe it down after use is a good idea. Obscure or frosted glass will add more privacy and will hide smudges and spots, but it is also more difficult to keep clean because of its textured surface. Shower doors can be completely frame-less, with no metal in their construction aside from handles and hinges. This style is easier to keep clean and is more dimensionally flexible to fit your space. However, it can be more prone to leaks and is more expensive. Framed doors are less expensive but are generally only available in standard sizes and may not fit your space. Also, while they are better at preventing leaks, they can be more difficult to keep clean. While bathtub style shower enclosures usually have sliding doors mounted on the top edge of the tub, swinging doors are also an option. 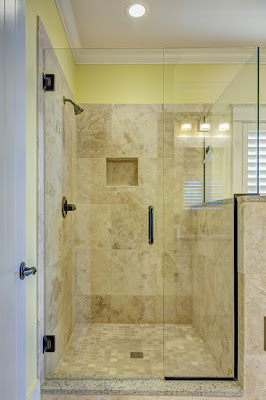 Walk-in shower enclosures are much easier to access. Doors of this style can stop short of the ceiling for a standard shower, or they may go all the way up for a steam shower. The enclosure may be all glass, or it could be a combination of glass, tile and/or stone. Any of these door styles may have attachments included. These may include add-ons and embellishments such as bumpers, decorative handles or towel bars. Glass shower doors offer more customization than you might think. With a little planning and research, opting for glass may be just what you need to help create your perfect bathroom.